Affiliated with the American Society of Biomechanics, the European Society of Biomechanics, the International Society of Biomechanics, the Japanese Society for Clinical Biomechanics and Related Research, the Australian and New Zealand Society of Biomechanics, and the Société de Biomécanique. The Journal of Biomechanics publishes reports of original and substantial findings using the principles of mechanics to explore biological problems. Analytical, as well as experimental papers may be submitted, and the journal accepts original articles, surveys and perspective articles (usually by Editorial invitation only), book reviews and letters to the Editor. The criteria for acceptance of manuscripts include excellence, novelty, significance, clarity, conciseness and interest to the readership. Fundamental Topics - Biomechanics of the musculoskeletal, cardiovascular, and respiratory systems, mechanics of hard and soft tissues, biofluid mechanics, mechanics of prostheses and implant-tissue interfaces, mechanics of cells. Cardiovascular and Respiratory Biomechanics - Mechanics of blood-flow, air-flow, mechanics of the soft tissues, flow-tissue or flow-prosthesis interactions. Cell Biomechanics - Biomechanic analyses of cells, membranes and sub-cellular structures; the relationship of the mechanical environment to cell and tissue response. Dental Biomechanics - Design and analysis of dental tissues and prostheses, mechanics of chewing. Functional Tissue Engineering - The role of biomechanical factors in engineered tissue replacements and regenerative medicine. Injury Biomechanics - Mechanics of impact and trauma, dynamics of man-machine interaction. Molecular Biomechanics - Mechanical analyses of biomolecules. Orthopedic Biomechanics - Mechanics of fracture and fracture fixation, mechanics of implants and implant fixation, mechanics of bones and joints, wear of natural and artificial joints. Rehabilitation Biomechanics - Analyses of gait, mechanics of prosthetics and orthotics. Sports Biomechanics - Mechanical analyses of sports performance. 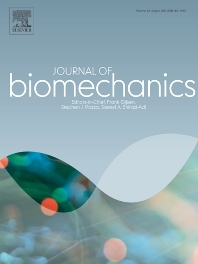 The journal is affiliated to the American Society of Biomechanics, the International Society of Biomechanics, the European Society of Biomechanics, the Japanese Society for Clinical Biomechanics, the Australian and New Zealand Society of Biomechanics, and the Société de Biomécanique.